The new Kosovo branch of the Scouts of America is instilling a sense of adventure in Kosovo’s kids, teaching its ‘cubs’ to be brave, loyal, kind, friendly, obedient, and to step up and give back to their community. The cub scouts of Kosovo’s aptly-named Pack 2008 are gearing up for one of their biggest events of the year, the Pinewood Derby Race. Cub scouts prepare religiously every year all over the world: handed just a block of wood, two bits of plastic and four wheels, they are tasked to build the fastest (and coolest) racecar in the pack. 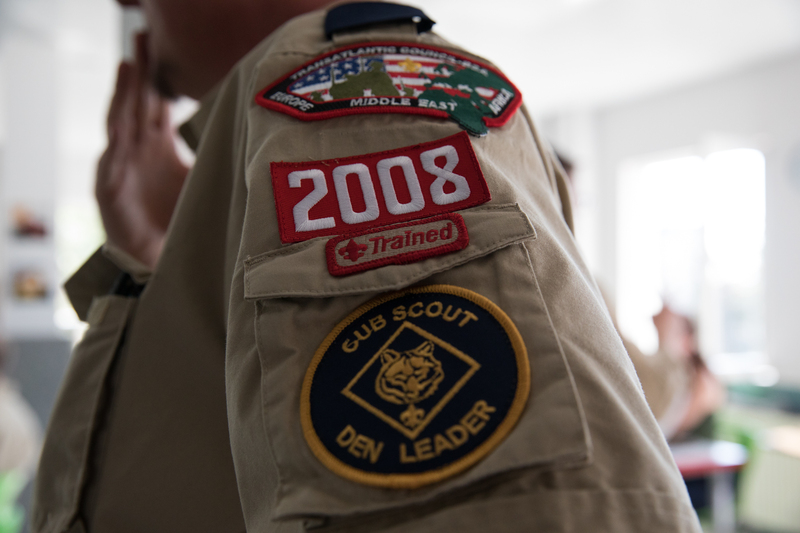 Kosovo’s branch of the Boy Scouts of America, is almost one year old. 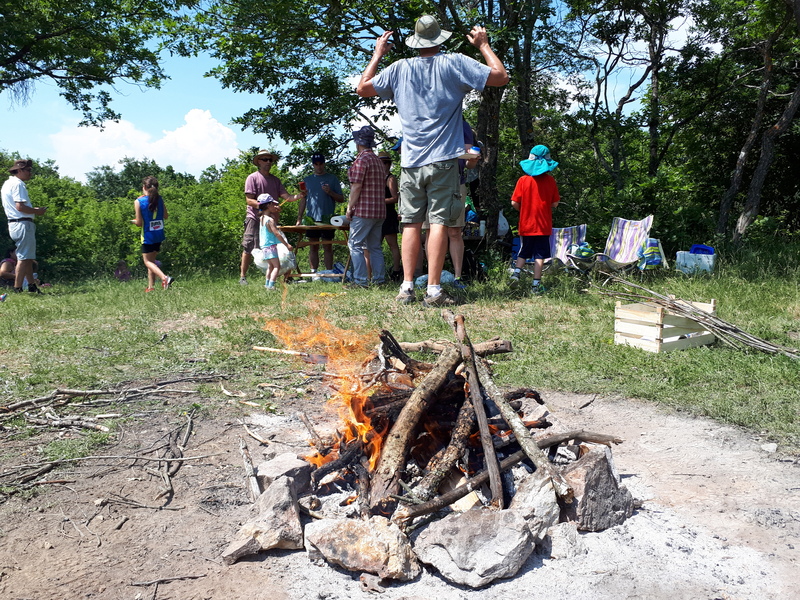 As the school year is starting to wrap up, they are looking to expand the pack across the country and get more kids involved in teamwork, outdoor activities, learning about nature and the world outside of the classroom. Hiking in Germia. Photo: Todd Kirkbride. Boy Scouts of America was established over 100 years ago, designed as a youth development program for kids in the United States to learn valuable life skills, both physical and educational, that are not taught in schools. You may have seen them marching around Prishtina clad in their uniforms, one American and one Kosovo flag patch sewn onto their sleeves. But being in the scouts is more than just a uniform, said Kirkbride, and goes above and beyond the skills that kids would learn in your average after-school activities. Over the year, the cub scouts participate in two or three meetings per month. This year, the pack has visited the bear sanctuary, gone horse riding, to the high ropes course in Peja, and hiking and camping in Germia, learning how to be courteous, kind, brave, and all the other values that are foundational to being a scout. Kosovo’s branch of the cub scouts is available for all kids that can speak a little English, said Kirkbride. Boys and girls from around five to eleven years old can go on adventures, complete challenges and reach educational milestones for which they earn badges they dew onto their uniform to celebrate their accomplishments. Once they are awarded all of their badges, said Kirkbride over the years they move up the ranks, from the ‘Tiger’s den,’ to the ‘Wolf den,’ the ‘Bear den,’ and so on until they join the ‘Arrow of Light,’ the last before they can advance to become a Boy or Girl Scout. It is not only the trained pack leaders that take part in scouts program, Kirkbride said. Families and parents can attend all of the pack meetings, and actively participate in helping kids to win their badges, whether it is building a birdhouse, taking care of a pet, or discussing what fellowship, community, and faith mean to them. Pack leader uniform. Photo: Valerie Plesch. Vjosa Murtezai-Reid has two children in the scouts program, eight-year-old Oliver and seven-year-old Elena. One of their favorite activities, she said, is hiking in Germia park, where they learn how to set up a camp, build a tent, light a campfire and try out the climbing wall. Murtezai Reid said that most of all, her son loved learning ‘pocketknife safety,’ where the kids learn how to carve mini sculptures using bars of soap or blocks of wood. Her daughter prefers the more social side of the scouts, she said, enjoying the opportunity to mingle with the Macedonian scout pack on their joint camping trip. The scouts get the chance to learn what ‘giving back’ means, said Kirkbride. 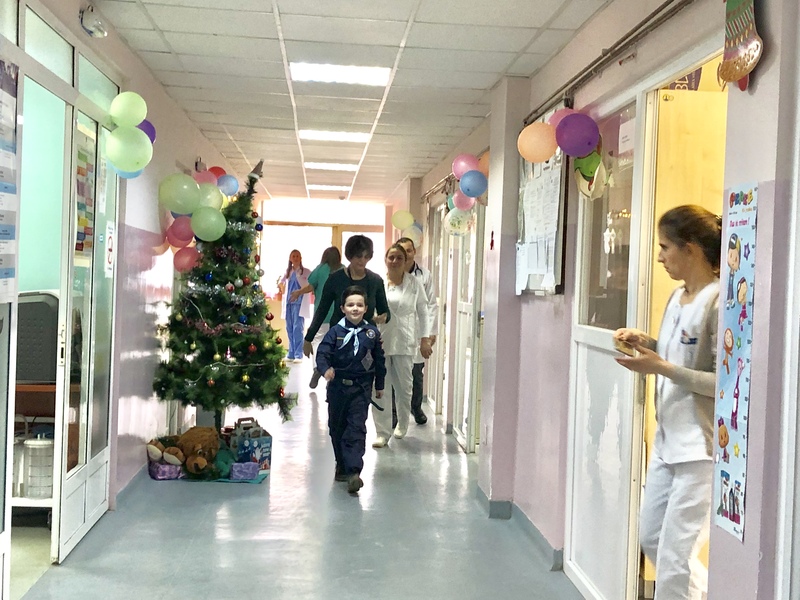 In December, the cub scouts raised money to give presents to children in the public hospital in Prishtina. Scouts visit to Hospital in Prishtina. Photo: Todd Kirkbride. Kirkbride and his pack leaders are trying hard to expand the families involved in the scouts program, aiming to include more local families for next year. He hopes that his fundraising efforts will help lower the costs for some of the scouts in the future. They are hoping to take a leaf out of the Girl Scouts of America’s book, who are world famous for their Girl Scout Cookies program. “They raise millions of dollars, they have competitions [between the girl scouts], they go out door to door, you’ll buy 15 or 20 boxes and you store them because you can only get them one time a year,” he said. He hopes to adapt this model for the Kosovo pack, selling chocolate bars and raise money to help keep the program afloat, but explained that he needs more help to realize his plans. Kirkbride said the costs of registration fees, uniforms, badges and other small fees throughout the year can add up to around 150 euros. This is out of reach for many families, Kirkbride said, but he hopes that as Kosovo’s Pack 2008 becomes more institutionalized, he can find a reliable set of local pack leaders to carry on the work, and find ways to make this more accessible for kids that otherwise would never get the chance to be a part of it. 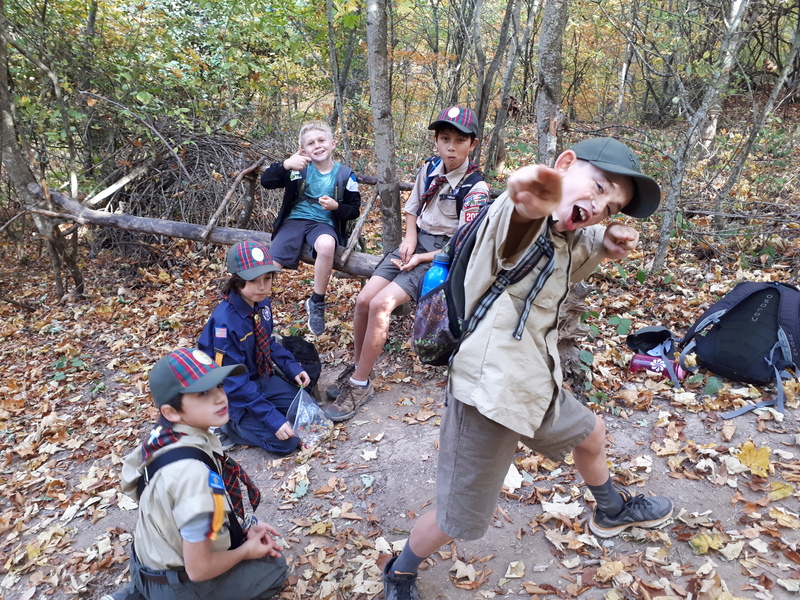 According to Murtezai-Reid, the scouts program is valuable both for her as a parent and a volunteer, and an indispensable learning experience for her children too. “Our pack leaders are all volunteers and they work so hard to give the kids the best scouting experience,” she said. Correction: Edits were made to this article on 4/6/2019, correcting the annual membership fee for cub scouts to 150 euros.